This page contains links to free math worksheets for Fraction Subtraction problems. Click one of the buttons below to see all of the worksheets in each set. You can also use the 'Worksheets' menu on the side of this page to find worksheets on other math topics. Fraction subtraction with common denominators and without whole parts. Subtraction of mixed fractions with common denominators. Subtraction of common fractions with halves and quarters. These worksheets worksheets have practice problems for subtracting fractions with different denominators. Subtraction of mixed fractions with different denominators. Subtracting fractions is similar to adding fractions. Most of the work involves the denominator. If the denominators of the two fractions are already the same, much of the work is done. Simply subtract the two numerators to get the answer fraction using the same denominator, and then reduce and make a proper fraction. If the two values being subtracted are mixed fractions, it is often easier to turn them into improper fractions to perform the subtraction. This avoids any kind regrouping or borrowing from the minuend fraction if the numerator in the subtrahend is larger. The steps for subtracting fractions is well illustrated in the fraction calculator at the link below. 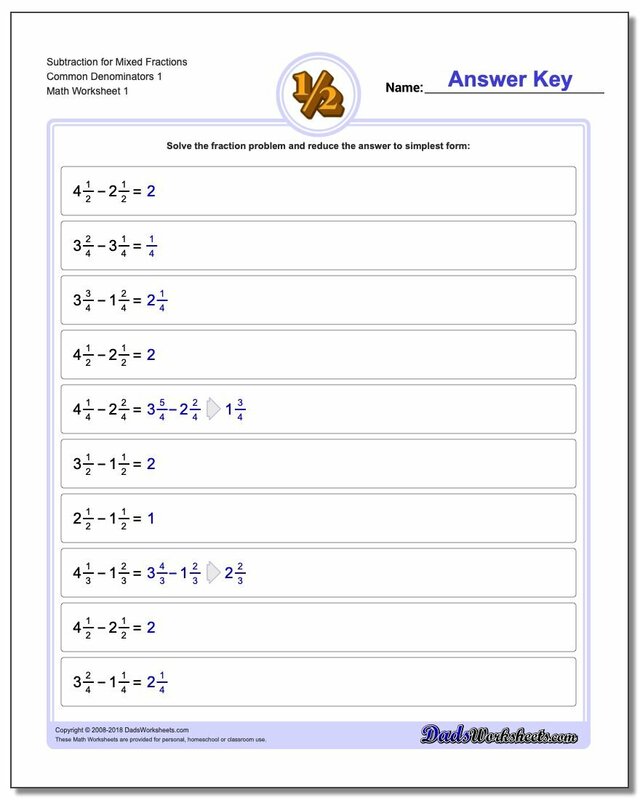 That page has a more detailed discussion of common denominators, mixed fractions and other topics that may help understand the steps necessary to subtract fractions.